Häfele is founded in Nagold in 1923 as a speciality store for joinery needs. The time following the second world war sees strong demand for fittings and hardware, and for joinery services. Häfele is an international company serving the foreign market through an extensive network of branch offices. 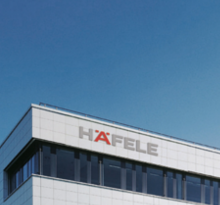 Häfele, an international company providing architecture hardware, furniture fittings and electronic locking systems, has a long and rich history that began in 1923. Today customers from 150 countries rely on Häfele's expertise and performance. Häfele Group, Häfele China, Production sites, Own house assortments. Häfele offers a wide range of diverse career opportunities. You will find all job vacancies and apprenticeships here. Learn more about our values and areas of expertise. Learn more about Häfele's company structure and business figures. Over the last 90 years, the German family owned and operated company has grown from a local speciality store for joinery needs into a company with global operations. Now 37 subsidiaries and many additional dealerships belong to the Häfele Group. Management is currently in the hands of the family's third generation: Sibylle Thierer became chair of the Häfele Group in 2003. The Häfele Group's business figures have continued to develop positively in recent years despite a challenging economic environment. In the 2016 financial year the Häfele Group had revenue of over 1.3 billion Euros with exports accounting for a 79% share. Häfele has 7,100 employees around the world and serves hundreds of thousands of customers from the furniture industry, dealers, joiners and cabinet makers, as well as architects, planners and builders.